Episode 71 of the Hop Cast is here just in time for the holidays. Ken Hunnemeder and Brad Chmielewski snuggle up in front of the fire to share a couple fine Christmas ales The first beer the two of them crack open is the Bell’s Christmas Ale. This Christmas ale falls under the style of scottish ale and comes in at 5.4% ABV. A solid beer but besides the label you’re not going to find any spices or anything reminding you of Christmas in this beer. Attempting to get more in the Christmas spirit, Ken and Brad go with the Frosted Frog Christmas Ale from Hoppin’ Frog Brewery . This is a beer both Ken and Brad have been hearing a lot about this season so they were very excited to be able to try it. And it didn’t disappoint, with an ABV of 8.6% it packs a bit of a punch and tastes like fresh out of the oven gingerbread. 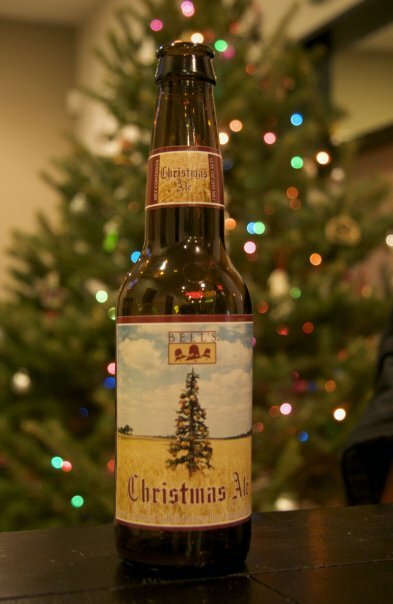 This beer has Christmas all over it and should get you in the holiday spirit. If you’re looking for something to go along with your Great Lakes Christmas Ale then this would be a perfect partner. It’s sweet and packs a lot of spice. Happy Holidays from the Hop Cast. Having issues watching this video? Try the Quicktime (201.4 MB). Have you had the Alesmith Wee Heavy? It’s a great Scotch Ale. Don’t think so. Any good?